I look around and me and my house is a mess and yet I am sitting here on this computer looking at nothing in particular and putting off the inevitable. But not only that, I have to declutter and just basically get organised. Now that I am getting used to the lack of sleep, I am getting around 4 1/2 hours a night, I think it's time I started to reorganise! That should be enough for today. Luckily we are having leftovers for dinner tonight - I made to yummiest barbecue chicken in the slow cooker yesterday. I got the recipe from my mothers group friend Rachel. So we are having it with some rice and vegies. Anyway, since I have sat here, Luke has decided to make some more mess, not that you can really tell. So I better hightail it and go and start on my to do list. Another week gone and another promise to update more regularly broken. Sorry about that. <----Here is Lusi and myself. Aren't we just too cool? Totally. I went and visited Lusi the other week and had a total ball! Can't wait to do it again! So I decided to enrol in KiwiScraps Freestlye Convention thingy in April. No, I am not a classes kinda girl, but I decided to go anyway as I think it will help me to let go more in my scrapbooking. That is my goal this year. Well, on the homefront, not much has been happening. Kate, being the big year 1 girl now has homework. All it is is a list of about 20 words that they have to copy once. Easy. She loves doing it. I got a letter home from school the other day and it seems Kate may have to move classes due to her class becoming a K/1 composite. We shall see tomorrow I guess. Luke was supposed to start his first day tomorrow at Family Day Care to allow me time to do some uni study since I work at night now. The poor little mite woke up with a runny nose! There goes my plans to get a haircut ad my eyebrows waxed. Maybe I might just take him along anyway. Surely a 3 year old boy can sit still for half an hour!?!? I have done my layout for this weeks competition over at Scrapbook City. The theme was Passion. All I could hink of was this somg out of Flashdance! LOL! I worked it into my layout of course! The results will be up tomorrow morning and I have my fingers crossed that I go through to Round 2. There were some mighty good layouts submitted. Well, I am sitting here supposed to be scrapbooking a layout for a CC at Scrapbooks Paper and Things - where Lusi teaches - but I didnt read the details properly and now my layout doesn't meet the criteria. Grrrrr. I really should read everything 3 times before I just jump in and start scrapping! I also have to finish my DT layout and finish another challenge layout. Man I am on the go! It's all good fun though. I have enrolled in some Yoga classes - just once a week for the next 8 weeks. I cant wait to start! It starts on tuesday. Hopefully it wont make me too sore! I have also been walking around the block again. After me and Luke drop Kate off at school we go - him in the pram - and me unfortunately pushing him up and down our hilly suburb. It takes just under 30 minutes. Not too long and not too short. Just right. I just want to note that I am grateful to my husband who indulges my creative side. Well thats about all we have time for folks. Thanks so much to everyone who comes by and reads my blog! I have been slack of late but hopefully I will be checking on you all soon! Now, I think I did something on the monday, but you know, I cant for the life of me remember what it was. Man I have to start blogging more frequently... or keeping a diary, but I suppose that is what this is. 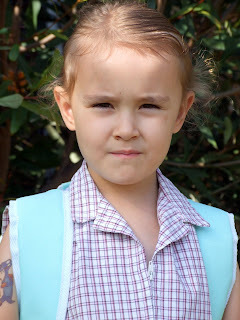 So Kate started Year 1 on tuesday. Only 2 other kids from her old class went into the new class. I was a little worried about that but I know she is in good hands as her teacher is awesome! I had a brief chat with her teacher as I thought maybe the class may have been graded, which was why she wasn't with her friends, but it isnt. So thats all good. Wednesday was just a boring home day. I had to go to the Family Day Care office to enrol Luke though as I am putting him in care one day a week (to start with) so I can get some uni work done. Thursday, well well well. I had a marvelous day! I went to my grandparents as Kate left something behind when she stayed there in the holidays, and then I drove a bit further up the mountains to go and visit Lusi for the day! I love this girl! We get on so well and I feel really comfortable with her. The kids got on famously too, which was awesome! Luke and Elijah were collecting snails and playing lego and playing with Buzz. I think Luke had just a good a day as me! Had so much fun talking about scrapping, and family and just well, stuff! Can't wait to do it again! Lusi is such a scrapping inspiration to me! She even gave me a notebook for my birthday which is gorgeous! Afterwards I picked Kate up from school and then went to a lady's house to check it out for Luke to go there for care. 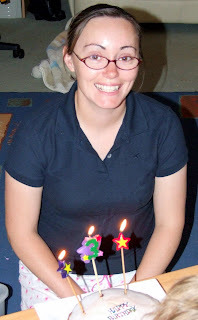 It turns out that she has a daughter in year one aswell, and yep, even in Kate's class! LOL! It's such a small world! I will reserve my judgements until he starts there, but for now, I feel a little obliged to send him there. We shall see I guess. Saturday I got to sleep in - yay! We went out to Forty Winks and bought a new matress for Luke but its not in stock until wednesday. Then we had KFC for lunch. Yum. Then we just bummed around and got a DVD out to watch - the Jack Black one where he is a wrestler, man I am having the biggest brain fart in the world! Anyway we watched that and had an early night. I started a Photo A Day challenge over at Blue Bazaar and well, I only took my forst photo yesterday. A self portrait. It turned out ok enough. I did it in the bathroom mirror. I am so thankful for the moveable LCD screen on the camera. LOL! 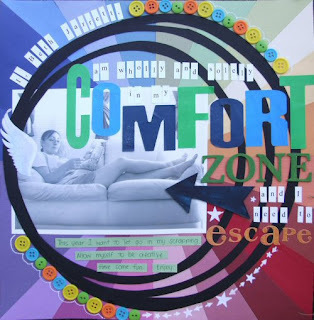 I am also participating in Reality Scraps over at Scrapbook City and I have made it through the qualifying round and now I am in the challenge with 20 other very talented ladies. It is very exciting to say the least! Our qualifying challenge was to do a layout about what we wanted to get out of Reality Scraps. And here was my entry. A layout inspired by a talk me and Lusi had about just 'letting go' and having fun! I just love the challenge to be honest. I work better with a challenge or a deadline. The week 1 challenge is 'My Passion'. I have a couple, not many really. But I have a few thoughts in my head. So I sit here now contemplating driving over to Spotlight, I heard they had a good deal on Urban Lily stuff, and thinking I would also like to get some fish for dinner. I think I just may pull my finger out of my behind and go and do just that. The other night I saw a snippet on TV about the book 'The Secret' and it is all about The Law of Attraction and it had a bit about being grateful. So I am going to post one thing I am grateful or thankful for in every post. I am thankful that I have a sweet husband who likes to give me backrubs when I am falling asleep.